Wrap deformers are can be useful in many situations, especially in procedural rigging. The idea is simple: "Deform one mesh according to the deformation of another mesh". In a common scenario meshes of higher resolution are wrapped to meshes of lower resolution to avoid expensive deformations calculations or weight painting for a large number of vertices. This article focus on this case but derives a variety of other uses like "shrink", "pickup" and "constraint"
A sphere is wrapped to a cube. To get deformation results of decent quality not only the translation of the cubes vertices has to be transferred to the spheres vertex members. Also rotation scale and shear have to be taken in consideration. 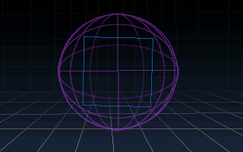 For translation and rotation the vertices and vertex normals of the cube provide enough information to transfer translation and rotation to the sphere. But for scale and shearing deformations just making a vertex level relation of the two meshes is not enough.